This poor sad story telling private is in a heap of trouble! Do you suppose John Murtha and the democrats will support him? As we’ve noted in this space, some have questioned details that appeared in the Diarist “Shock Troops,” published under the pseudonym Scott Thomas. According to Major Kirk Luedeke, a public affairs officer at Forward Operating Base Falcon, a formal military investigation has also been launched into the incidents described in the piece. Although the article was rigorously edited and fact-checked before it was published, we have decided to go back and, to the extent possible, re-report every detail. This process takes considerable time, as the primary subjects are on another continent, with intermittent access to phones and email. Thus far we’ve found nothing to disprove the facts in the article; we will release the full results of our search when it is completed. 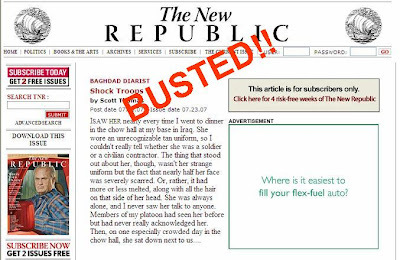 My Diarist, “Shock Troops,” and the two other pieces I wrote for the New Republic have stirred more controversy than I could ever have anticipated. They were written under a pseudonym, because I wanted to write honestly about my experiences, without fear of reprisal. Unfortunately, my pseudonym has caused confusion. And there seems to be one major way in which I can clarify the debate over my pieces: I’m willing to stand by the entirety of my articles for the New Republic using my real name. 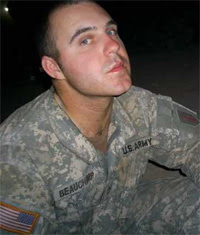 I am Private Scott Thomas Beauchamp, (Photo from his My Space page via Michelle Malkin) a member of Alpha Company, 1/18 Infantry, Second Brigade Combat Team, First Infantry Division. My pieces were always intended to provide my discreet view of the war; they were never intended as a reflection of the entire U.S. Military. I wanted Americans to have one soldier’s view of events in Iraq. It’s been maddening, to say the least, to see the plausibility of events that I witnessed questioned by people who have never served in Iraq. I was initially reluctant to take the time out of my already insane schedule fighting an actual war in order to play some role in an ideological battle that I never wanted to join. That being said, my character, my experiences, and those of my comrades in arms have been called into question, and I believe that it is important to stand by my writing under my real name. Private Beauchamp is in a heap of trouble! And, so is The New Republic for publishing such obviously bogus stories. The Weekly Standard Blog has been leading the efforts to get to the truth behind these stories by Beauchamp. Powerline thinks this controversy will be resolved in short order. So no doubt wheels are turning over in the 1/18’s command staff right now. Wouldn’t be surprised if Private Beauchamp was standing tall in front of the man at this very moment, under the scruntity of an aggressively curious CO who is demanding details down to the letter about each of his diary entries. Expect a press release soon. The Army is going to move quick on this, now that they have a face to the name. Either way, today is going to be a very bad day for Private Scott Thomas Beauchamp. Blackfive has a must read. Michelle Malkin is piling on. UPDATE: Ace says that TNR is much more worried than they are letting on.